From the star of The Radkes, the reality show premiering on USA network on June 4, this is the hilarious, heartbreaking, and inspiring journey of one woman learning to stand up for herself in a world of naysayers, by the creator of the "Red Ribbon Week" video, which has over 150 million views. 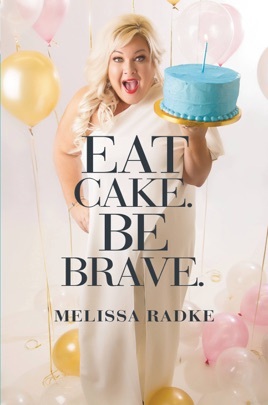 My name is Melissa Radke, and there is a very real chance you have no idea who I am or why I wrote a book. But admit it, you're curious! Even though millions of people seem to like watching my videos bemoaning the trials of parenting, marriage, French braiding, faith, and living life as an anti-aging female, you may still be wondering who let me write a book. I mean, books are written by people who have been interviewed by Gayle King and say things like, "You see, Gayle, I was having a root canal and I literally died in the chair. I saw heaven. Also, when I came back to earth I could speak Mandarin." Yeah, that didn't happen to me. No Mandarin. Though I have been known to break out in song! (My voice was once described as a "ray of light in a dark world" . . . but I think my dad was being a little dramatic.) Although if Gayle King were to ever ask me I would tell her: "I wrote this book between taking my kids to the local pool and picking out flip-flops at Old Navy, and the only metaphysical moment I experienced came right after I looked directly into one of those mirrors with 10x magnification." Excellent book...One minute you are laughing at her silly antics, and the next minute you are crying because of the tragedy she has endured. This book is real. Not in a Real Housewife kind of way but real in that you feel what she is feeling. I laughed so hard I cried. And then there were the moments she really made me cry. Melissa is the kind of woman you would want for a bestie. She’s laughable and lovable and just plain honest y’all. But it. Read it. Enjoy.